Read our helpful guide to second hand Honda CR-V.
Why buy a used CR-V? Which used CR-V should I buy? AA Cars works closely with thousands of UK used car dealers to bring you one of the largest selections of Honda CR-V cars on the market. You can also browse Honda dealers to find a second hand car close to you today. 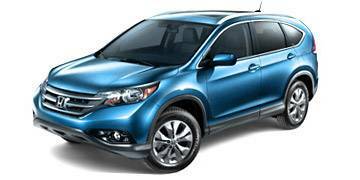 All used Honda CR-V on the AA Cars website come with free 12 months breakdown cover. A 4X4 that is better on the road than off it, the Honda CR-V is in many ways simply a Civic in grown up's clothes. What this means is that it can be a surprisingly nimble car, which with luggage space extending up to nearly 1,700 litres, is also impressively practical. While some might find it slightly mundane to be using a 4X4 for the school run rather than climbing muddy hills, it's here that the CR-V's strengths lie. First released in 1995, the Honda CR-V was one of the first ever compact crossover SUVs that mixed an agile car-like drive with rugged 4X4 ability. Now in its fourth generation it remains a reliable, comfortable and competent option in a fast growing market. Today it boasts less 4X4 ability than the first model, but with plenty of space, a solid build, plenty of versatility and good run costs, the Honda CR-V stands out as one of the best value crossovers on the market. Throughout its four generations the Honda CR-V has stood out as one of the best-driving crossovers available. Today's model (fourth generation), faced with a market growing ever more competitive, doesn't stand out quite as much as its predecessors, but there is still plenty to enjoy. Handling is accurate and is helped by excellent grip, although there can be some body roll when taking corners too heavily. On the road the suspension soaks up most rough edges, but off road the CR-V doesn't quite compete with its more able rivals. A 2.2 litre turbodiesel leads the charge in the performance options, and while it doesn't shine in its most recent generation as it did the previous one, it remains a competent and powerful option. Producing 148bhp, it pushes the CR-V to 62mph in a competitive 9.7 seconds while returning a respectable 44.7mpg and 154g/km. A 2.0 litre petrol option is also available, but lacks the mid-range kick its diesel sibling offers. Inside, the cabin is spacious and practically designed, featuring plenty of hidden cubby holes and versatile storage areas. The driving position is good, while rear passenger space is room enough for two adults; unusually large windows and lowered seats bring about plenty of headroom, too. Luggage space is particularly good, and with easily adjustable seats the already immense boot extends from 589 litres to 1648 in an instant, making it one of the most versatile and practical in its class. Like all Hondas, the CR-V is build very well, has an excellent reliability and satisfaction record and boasts the maximum five starts in the Euro NCAP crash tests. Some materials aren't quite as luxurious as they could be, but considering the price and its durability, it is a worthy compromise. The first Honda CR-V was released in 1995 and has been a consistently top seller in the US and in the UK. Here is a short history of the CR-V, starting with its launch in 1995. The first Honda CR-V was launched in Japan 1995, and was Honda's first ever in-house designed SUV. The second generation CR-V was launched in 2002 and was based on the seventh generation Civic. Bigger and heavier than the outgoing model, it was a more rugged and able SUV than the first. In 2007 the third generation is released. Following on from the success of the previous model, the CR-V is named as the USA's best selling SUV that year. A facelift in 2009 brings about added luxury to the UK model such as 18" alloy wheels, GPS and a premium stereo system with USB input. The fourth generation CR-V was unveiled at the 2011 Los Angeles Auto Show and went on sale the following year. 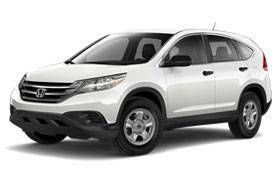 In 2013 the Honda CR-V was named the Most Popular 4X4 by motoring website HonestJohn.co.uk. There are a number of different trims levels and variants to choose from in the Honda CR-V range. Here are the options in the latest generation. 17" alloy wheels, dual zone climate control, electrically adjustable and heated door mirrors, intelligent_Multi Information Display, radio system with USB and AUX connectivity, Vehicle Stability Assist, Trailer Stability Assist, Hill Start Assist, Hill Descent Control, paddle shift, halogen headlights, daytime running lights, SRS cut off switch. 17" alloy wheels, dual zone climate control, electrically adjustable and heated door mirrors, intelligent_Multi Information Display, radio system with USB and AUX connectivity, Bluetooth connectivity, SD navigation Vehicle Stability Assist, Trailer Stability Assist, Hill Start Assist, Hill Descent Control, paddle shift, halogen headlights, daytime running lights, SRS cut off switch. Front and rear parking sensors, rear view camera, Bluetooth connectivity, dusk sensing headlights, rain-sensing wipers, auto dimming rear view mirror, 17" alloy wheels, dual zone climate control, electrically adjustable and heated door mirrors, intelligent_Multi Information Display, radio system with USB and AUX connectivity, Vehicle Stability Assist, Trailer Stability Assist, Hill Start Assist, Hill Descent Control, paddle shift, halogen headlights, daytime running lights, SRS cut off switch. Front and rear parking sensors, rear view camera, Bluetooth connectivity, dusk sensing headlights, rain-sensing wipers, auto dimming rear view mirror, 17" alloy wheels, dual zone climate control, electrically adjustable and heated door mirrors, intelligent_Multi Information Display, radio system with USB and AUX connectivity, Vehicle Stability Assist, Trailer Stability Assist, Hill Start Assist, Hill Descent Control, paddle shift, halogen headlights, daytime running lights, SRS cut off switch, SD Navigation. Front and rear parking sensors, rear view camera, front heated seats, Bluetooth connectivity, dusk sensing headlights, rain-sensing wipers, auto dimming rear view mirror, 18" alloy wheels, dual zone climate control, electrically adjustable and heated door mirrors, intelligent_Multi Information Display, radio system with USB and AUX connectivity, Vehicle Stability Assist, Trailer Stability Assist, Hill Start Assist, Hill Descent Control, paddle shift, halogen headlights, daytime running lights, SRS cut off switch, Active Cornering Lights, Bi-HID headlights with headlight washers. Front and rear parking sensors, rear view camera, front heated seats, Bluetooth connectivity, dusk sensing headlights, rain-sensing wipers, auto dimming rear view mirror, 18" alloy wheels, dual zone climate control, electrically adjustable and heated door mirrors, intelligent_Multi Information Display, radio system with USB and AUX connectivity, Vehicle Stability Assist, Trailer Stability Assist, Hill Start Assist, Hill Descent Control, paddle shift, halogen headlights, daytime running lights, SRS cut off switch, HDD satellite navigation, panoramic glass roof, leather upholstery, Active Cornering Lights, Bi-HID headlights with headlight washers. What should I look for when buying a used CR-V? Known as one of the most reliable and trusted manufacturers there is, Hondas can be counted on for reliability. However, it is worth checking any used car for some of these points. Make sure that the cambelt has been changed accordingly. Honda recommends it is changed within five years or 60,000 miles. If this hasn't been done the cambelt is likely to fail and can end up in costly repair work. I-Vtec engines have chains, so don't need changing. CR-Vs produced between 1999 and 2001 are prone to suffering from exhaust valves burning out. Check the paperwork to see whether the cylinder head has been replaced, and if not, check to see that the engine performs smoothly on the road. Stalling when cold or struggling from standstill are indicative of a building problem. When on the road, listen for any knocks or clunks coming from the car when driving over rough surfaces. This could mean that the suspension is faulty and a drop link needs replacing. If there is a groaning noise coming from the steering wheel when pulling away on full lock it could be a sign of the rear differential needing replacing.